When we talk about natural treatments for acne, we usually talk about tea tree oil. But the preparation of marigold petals known as calendula also has potent anti-inflammatory power for calendula. Calendula, an ingredient made from marigolds, kills bacteria that causes acne! 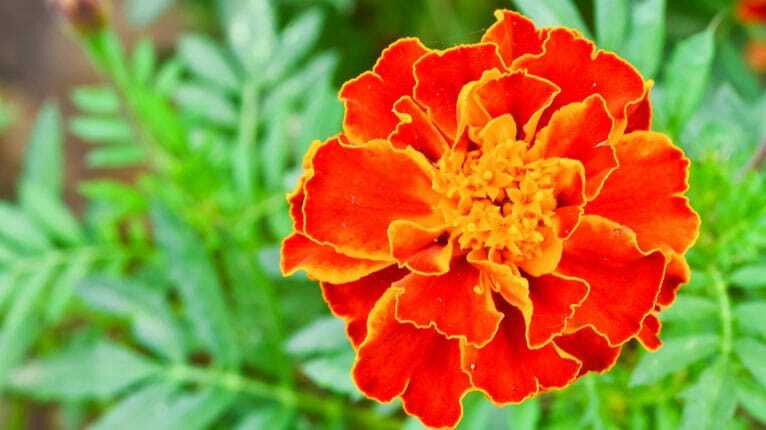 The species of marigold used to make calendula skin care products is Calendula officinalis, which is also known as a pot (as in a container) marigold. Not an especially showy flower, it bears yellow petals around a golden flowerhead on a short, dark green stalk. Calendula has been used as an herbal medicine for thousands of years. It used to be employed in making teas for calming the stomach, but nowadays it is more commonly used in small amounts to make creams for skin care. Calendula kills the Propionibacterium acnes bacteria that cause acne and the staph and strep bacteria that kill impetigo. It’s mildly antiviral, and gets the redness and swelling out of infections by its anti-inflammatory activity. Calendula is also used in mouthwashes, but in the mouth, it is more useful for relieving inflammation than for killing germs. How Effective Is Calendula For Acne? Most of the clinical studies of calendula as a skin care treatment have been conducted in tropical countries, where moisture is seen as the missing factor when acne breaks out. Scientists at the Islamic University at Bahawalpur in Pakistan tested various formulations of calendula for moisturizing the skin and making it more elastic. They found that skin creams that contain about 4% calendula (1 part of calendula and 24 parts of a carrier oil) work best for making tight skin more flexible so both wrinkles and blemishes smooth out. Skin researchers at the Universidade de São Paulo in Brazil tested calendula creams as a means of preventing damage to the skin caused by ultraviolet light. They found that two compounds in the herb, narcissin and rutin, help regenerate the antioxidant glutathione. In turn, glutathione stops some of the inflammatory reactions that damage the skin when it has been exposed to UV light. On the other hand, calendula did not interfere with the action of an enzyme called gelatinase, which helps the skin get rid of damaged cells so it can replace them. And although it is not directly related to the ability of calendula to treat acne, it is worth mentioning that calendula creams and gels are as helpful as aloe vera when it comes to treating burns. Scientists at the Amala Cancer Research Centre in India conducted experiments that found that plant chemicals in calendula seem to help the skin use the amino acid hydroxyproline, which appears in the connective tissue around which it builds new skin. Calendula reduces whole-body stress after a burn and accelerates the healing of a wound, but the effects may take several day to be noticeable. The very best time to use a calendula product to treat acne is when you have both acne and impetigo. This most commonly occurs when you have been a little too rough in trying to treat your acne. Maybe you tried to pop a pimple and you only succeeded at breaking the skin around it. Or you rubbed and scrubbed your skin raw trying to get rid of discoloration. Or you used a harsh detergent soap. The first thing calendula does is to soothe your skin. That’s important, because it isn’t just the rubbing and scrubbing and irritant chemicals that damage your skin. The skin’s nervous system can sense the damage you do to your skin and send a message to skin cells to release histamine. This is the chemical that also causes allergic reactions. It also can destroy skin that might be “held hostage” by a skin-irritant ingredient to keep it from getting into the bloodstream. If you had the stinger of a bee or a tiny fleck of a toxic metal in your skin, this would be a good thing, but if the problem is just having done too much rubbing and scrubbing or having used a detergent chemical on your skin, then the histamine reaction isn’t helpful. Calendula keeps the irritation from getting worse. Then calendula fights infection. It interferes with the ability of bacteria to use iron, which they need to multiply. Calendula does not so much kill bacteria as to hold them in stasis until your immune system can kill them with a minimum of irritation. Can Anything Go Wrong With Using Calendula? Even though 99% of people who use calendula will experience decreased inflammation, occasionally someone who uses calendula will experience increased inflammation. Allergies to calendula are possible. The people who are most susceptible to calendula allergies are those who have allergies to other plants in the same family, such as arnica and ragweed. Generally speaking, if you have an allergy to ragweed, you should not use any products that contain either of the calming herbs in the same family, calendula and chamomile. What if you don’t know whether you are allergic? It’s always a good idea to test a tiny dot of a product you have never used before on the skin on the inside of your forearm before you spread it all over your face. Leave just a dot of the product on your arm for eight hours. If there are no visible skin reactions on your arm, then it is likely to be safe for use on your face. Do this every time you switch brands of the same herb or you try a new herb. What Are Some Common Calendula Products? The least expensive way to use calendula is to buy a tiny bottle of calendula tincture. You can simply add a few drops of the tincture to any kind of neutral skin cream you use every day just before applying to your face, or you can add a few drops of tincture to every application of face wash.
Or you may prefer to buy ready-to-use calendula products such as Arbordoun’s Abundantly Herbal Calendula Cream or California Baby Calendula Cream. If you opt for the homeopathic version, Boiron Homeopathic Medicine First Aid Calendula Cream, you’ll spend about 20 times as much per application, although the product gets good reviews. Is Natural Skin Care Better For Acne? This is very useful information here. Thanks so much for allowing us your knowledge. I have a very sensitive skin and have a very serious case of acne. I live in the tropics and have tried several cosmetic products but to no avail. Can you please suggest possible natural treatment for me? I'll be very grateful if you do. Thank you so much.